Effie McIver has been living quietly on her own since the break up of her marriage to Jack who left her for her best friend. A visit to the doctor leaves her feeling restless and she experiences further disturbance during a visit to her daughter's house. These events lead her to conclude that something must be done to change her life. 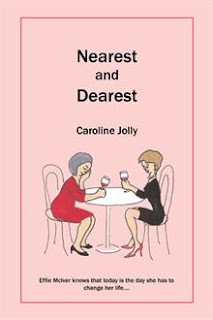 With the help of her friend Susie she decides to venture into the uncertain world of dating. Here she encounters a variety of people and situations, hilarious or humiliating, in her search for a new partner. The search takes place against the backdrop of her increasingly complex relationship to her daughter Cathy and her family. Meanwhile, on the dating front, she meets Oliver, a widower and a 'no hoper' who through persistence and a degree of change enters Effie's social life. A cluster of circumstances precipitate her into a shocking crisis within the family which slowly evolves, with the help of friend Susie and the keeping of a diary, towards a resolution. The mood of the story is essentially light, compassionate and humorous, as Effie explores her strengths and obvious weaknesses both as an older woman negotiating the choppy waters of dating and also as a parent managing her relationship to grown up children. Caroline Jolly was brought up in Scotland, studied in London and East Africa, and works as a psychotherapist in private practice in London where she now lives. Caroline is giving away a $25 Gift Card! Winners will be contacted via email on November 5.